I have written before about the disappointing Italian restaurants in Nottingham, certainly in the city centre. Dominated by the common chains it is certainly lacking that solid, rustic, local Italian of great value. Other cuisines are much better represented but only Piccolino (a smaller chain) and the disappointments of Dolce and The Pelican Club make any showing on behalf of Italy. A few recommendations have come my way from outside of the city centre, Reno’s and Navarra are on my list but Gino’s was the first to take my custom. 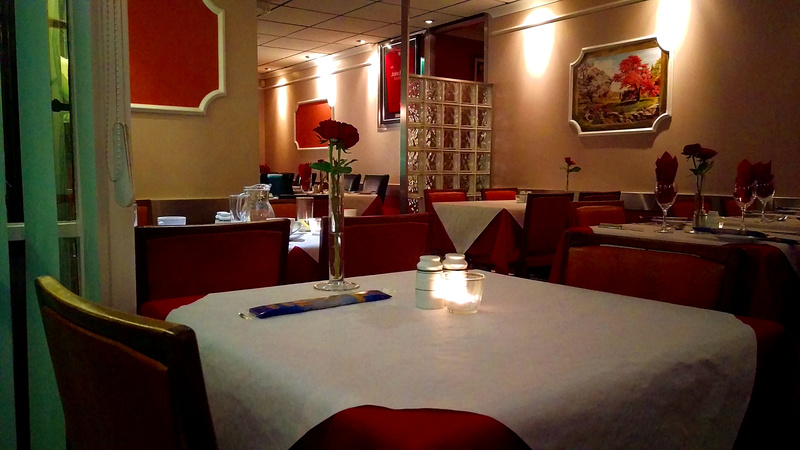 Ruddington village is the quaint setting for Gino’s, and a quaint restaurant it is too. The combination of red and white table cloths makes an appearance, a rose, candle and some breadsticks appear on every table too. Yes it might be old fashioned but there is something comfortable and comforting about it. It was busy midweek too, good to see but unfortunately to the extent that I felt a little too close to a couple next to us. The menu is firmly an a la carte affair with individual pricing. Strangely nothing appealed amongst the starters, I had fancied a bruschetta or something fresh, however the options were dominated by things in rich or garlicy sauces. I was equally undecided about a main course choice; I was thinking about pasta but asked the waitress if she could recommend something. As quick as a flash she responded that steak was the way forward. It could have been a very confident upsell but I took it at face value and went for the rib eye that had been singled out. It was a serious plate of food, a mound of fries dominating the plate. The main event was a sizeable 16oz and decent enough, though it suffered from needing a little more seasoning and was cooked over the medium rare I requested. Accompanying mushrooms were good but again nothing special. We also ate a separate bowl of veg where peas were enjoyable (admittedly pretty hard to get wrong) but the remainder had had too long in the pan. 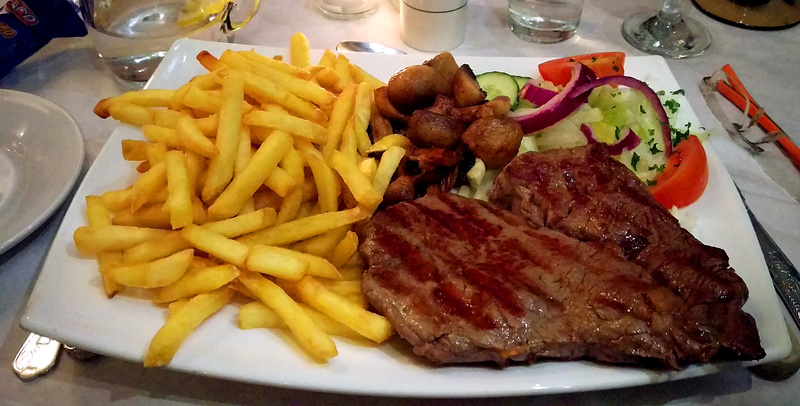 For £13.95 you get plenty of food including that hefty steak, despite this quantity the overall quality was underwhelming. Having eschewed the option of a starter I thought I better sample a dessert. I often don’t have enough of a sweet tooth so when the opportunity presents itself I feel I should take it, Tiramisu is also one of my favourite desserts. The version here wasn’t too my taste, saying that some of this is down to personal preference. I favour a sloppy one, lots of coffee, lots of liqueur but in contrast this was a particularly light example. It could have been ok, but the lines of cheap chocolate sauce drizzled over the plate dominated the flavour. I was left a little puzzled as to the popularity of Gino’s. My suspicion is that the very reason I don’t think that Gino’s is great, the fact its menu appears not to have changed for 10 years, is exactly the reason some people come here. There is a level of comfort in being greeted by the friendly Italian owner of your local, and I am sure they treat their regulars well. For me the hunt continues for a really good restaurant of this cuisine. In the meantime if I wanted a good feed I’m sure I could rely on getting it here, but for me that’s just not quite enough. Re. the ‘puzzling popularity’ of this type of Italian restaurant, I think your suspicions are pretty much correct. These places don’t trade in the city centre – where a lot of destination and chain restaurants do business flogging on trend food to shoppers and day visitors – but on the fringes of the city where they are well-loved by locals who like them precisely because they know what they’re getting. The owners tend to have lived in the UK since the 70s and 80s: they know what sells well and have little or no incentive to change their menus. It’s easy to forget a lot of people aren’t too taken with pulled pork on chopping boards, with craft ale at £4.60 a pop. They want meat, sauce, veg, and a litre of house wine in a place they know well. Fashionable, no. Reliable business, definitely. It’s also little surprise that the food is quite often far removed from proper Italian cuisine – it’s simply food their punters want. One chef told me he started selling carbonara the proper Italian way, but his regulars started asking where the cream was so he reverted back to that method! It’ll never earn them much in the way of kudos with foodies but they’re busy enough without good reviews or word-of-mouth buzz. La Capanna is a very similar restaurant in Sherwood. It’ll never win any awards, but it’s always rammed on Friday/Saturday nights and, like Gino’s, will almost certainly outlive a good number of trendier city centre places. Thanks for taking the time to share your thoughts Pete. An astute observation I would say!